The Difference between an HDD and SSD hard drive – The hard drive is a key component of laptops or desktops. Behind its very technical aspect, the choice of a hard drive proves to be relatively straightforward. There is little leeway for error, and you should not worry about buying the “wrong” hard drive. Let’s see in detail the aspects to be taken into account when choosing its hard drive and SSD. An external hard drive (or DDE) is a portable storage device that is usually connected to a computer via a USB, FireWire or wireless connection. External hard disks typically have high storage capacity and are commonly used to store data and perform backups. Using an external hard drive simply requires connecting the drive cable to the computer, although in some cases there may be problems with operating system compatibility ( The hard drive problem of the external hard drive not recognized, more information about this problem on supergeek.fr). These types of hard disks make it possible to store a large number of files, music, videos or images thanks to their high storage capacity. The Hard drive of a computer plays the essential role of storing and retrieving information. Hard disk drive (HDD) drives are the most commonly used for desktop computers. These disks, internal or external to the computer, consist of one or more mechanical discs that read and write information about the disc. SSD drives use a flash memory (not mechanical like HDD) to store the information. They offer improved durability and superior performance to HDD drives. Nevertheless, the latter has a generally higher storage capacity for a lesser blow. Differences between a hard drive SSD and HDD? SSD and hard drives do the same job globally: they allow you to start your operating system, store your applications and your personal files. But each has its own specific characteristics (storage capacity, price, speed, etc.). SSDs are more expensive than HDD regarding Euro per gigabyte. An internal HDD of 2.5 “of 1 TB costs on average between 50 and 70 euros.” However, it will take about 300 euros for an SSD of the same capacity. Although there are several TB SSDs (up to 16 TB), the latter remain rare and costly. The HDD from 500 GB to 1 TB is commonplace and is considered as a basic capacity. As for SSDs, the first prices offer a storage capacity of around 128 GB. The speed of execution is the strong point of the SSD. A computer with an SSD will start in less than a minute (a few seconds for the most part) and be faster for launching and running applications as well as for transferring files. Whether you use your computer for leisure, school or work, speed remains a criterion of choice for a computer. An SSD has no moving parts, so it is more resistant to shocks compared to an HDD. Some external hard disks nevertheless have protection to deal with this problem (such as rugged discs, water, dust, shocks and falls). HDD’s are the most common and most accessible although SSDs are starting to be more and more present in particular in small netbook laptops and ultrabook with storage capacities ranging from 256 to 516 GB for the most part. SSDs are known for their performance. If you decide to opt for an SSD for the benefit of a hard drive, be aware that there are two common SSD sizes. The 3.5 “is suitable for desktop use while the 2.5” is designed to meet a laptop use (with a smaller space). Note that it is possible to connect a 2.5 “SSD to a 3.5” array via an adaptor, but the reverse is not possible. In the case of a laptop purchase, the default size of this SSD will be 2.5 “. In this case, it is appropriate to take an interest in the other technical specifications of the SSD. We think of noise first: internal or external HDD drives are relatively noisy. Even the quietest of the HDD will emit a slight noise because of its reading arm and the rotation of its disc. By their flash memory, the SSDs produce virtually no noise. Next comes energy consumption: an SSD must not consume electricity to run a platter. So he’s less energy than his brother. This lower energy consumption translates into several minutes/hours of autonomy also. Some manufacturers have implemented a solution for pairing a flash memory with a mechanical HDD. 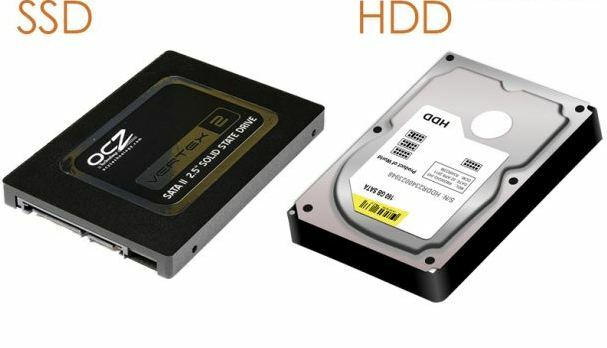 These “hybrid” models combine the storage capacity of an HDD and the performance of an SSD for a price slightly higher than a conventional hard drive. The flash memory serves as a buffer for frequently used files to speed up the launch of important applications. Other technologies also exist to combine HDD and SSD on the same computer, such as Intel’s Smart Response Technology (SRT). SRT uses the SSD as a cache to start the system or launch programs faster. Although SSDs are increasingly democratized, they are still costly but efficient alternatives to HDD. HDD drives outweigh the issue of price, storage capacity, and availability on the market. As for SSDs, they are definitely faster, sturdier, more compact and less noisy. SSD drives are thus a choice option for laptops.